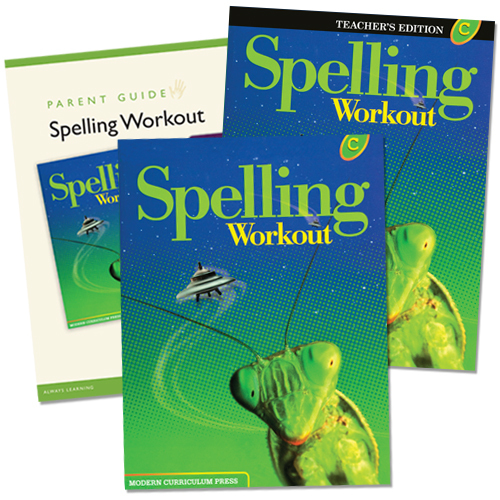 Modern Curriculum Press: Spelling Workout - Level C Homeschool Bundle (9781428432697). Student Edition: Each lesson begins with a short article to capture children’s attention. The lesson’s spelling words are then presented along with a related spelling tip. Additional activities follow where your child will complete exercises, riddles, and puzzles to review the lessons skills. The lesson ends with a wrap-up and some review exercises to assess your child’s comprehension of the material covered. Every few lessons your child is also presented with a cumulative review. Teacher Edition: The Teacher’s Edition provides everything you need to deliver complete instruction to your child. The the courses lessons are flexible to cover either a 3-day or 5-day week. The 2-page lesson plan is presented in the margins around a reduced version of the student book, annotated with the exercise answers. The book also offers activities for reinforcing and analyzing spelling patterns and ideas for personalizing the instruction for your child.